Oil States International (OIS) is a oil services company that is spinning off its accommodation business, Civeo Corporation, later this month (it goes "when issued" Monday, and trades "regular way" on 6/2) after some nudging from activist investors last spring. Civeo provides accommodation services for the resources industry in remote locations, think "man camps" that kind of look like portable prison complexes. As apart of Oil States, Civeo is taxed as a C-Corp, but shortly after the spinoff Civeo's board intends to evaluate converting to a REIT structure, eliminating corporate level taxes, providing an immediate increase in the business's valuation. This isn't a new idea, but despite JANA partners and Greenlight Capital being major shareholders, there's still a significant disconnect in the combined company's current valuation. The company has laid out the typical reasons for the spinoff: management focus, optimize each unit's capital structure, cleaner for investors to value, acquisition currency, and aligning incentives. Both businesses are attractive, it's not a classic spinoff where one of the businesses is orphaned and dumped in order to make the parent's results more appealing. However, the real value is the REIT conversion, REITs are valued more richly than C-Corps due to their tax advantaged status. The pre-spin OIS trades for roughly 7x EBITDA, lodging/multi-family REITs trade in the 15-20x range, as long as the OIS stub remains priced at 7x EBITDA, a lot of value is going to be created through the spinoff and REIT conversion of Civeo. 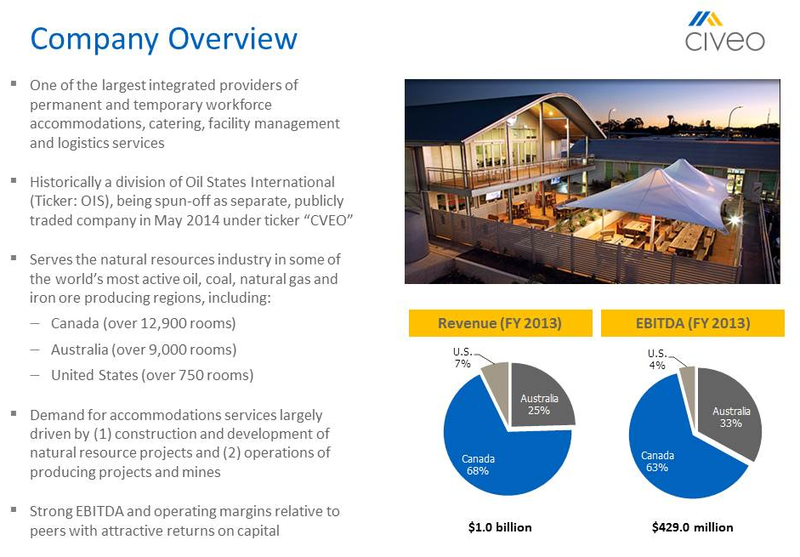 Civeo is a pretty unique lodging company, they provide medium term (contracts are around 3 years) accommodations services to remote resource mining operations, a valuable service since infrastructure and labor supply is lacking in these far off locations. Some of their lodges/villages can be quite large, for instance their Wapasu Creek Lodge has 5100 rooms, making it the second largest lodging property in North America behind the MGM Grand in Las Vegas. Their operations are primarily located in the Canada oil sands region in Alberta, and around major metallurgical coal mines in Australia (as a result of the late 2010 acquisition of the MAC). Being a US based company, this exposes Civeo to considerable currency risk, in particular Australia worries me being so closely tied to the Chinese economy. Another unique feature of Civeo's business is the permanence of their real estate and how the market might value it? 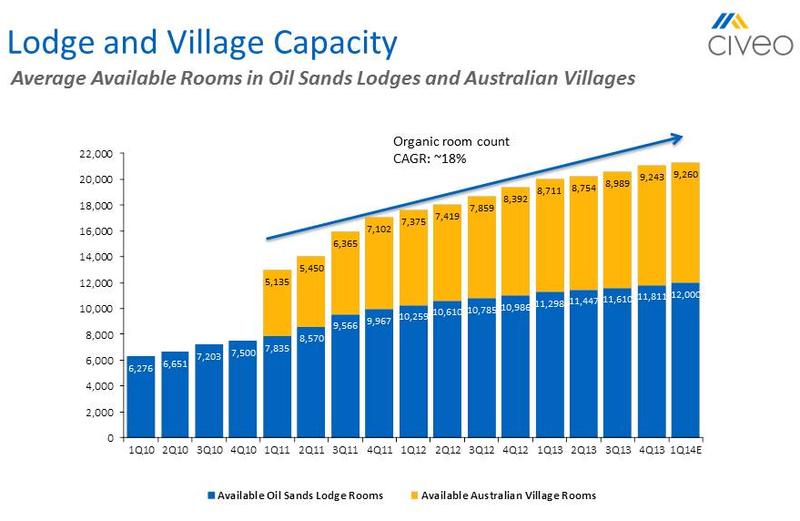 They focus on providing accommodations to long lived resource assets, in the 30-50 year time frame, but their lodges (at least in Canada) are on leased land, and presumably depreciation expense is more real as a result. Civeo sports a nice growth profile as seen above. They "land bank" in growth areas like the west coast of British Columbia near potential LNG projects - their current lank bank pipeline could add another 15,000 rooms to their asset base over time. One reason for the current discount might be due to a lack of pure comparables, do you value Civeo as a hotel REIT, multi-family/apartment REIT? I blended the two below and threw in Extended Stay, which is not a REIT but is similar in that it tries to create a medium term apartment feel in a hotel. As you can see, this peer group average is valued at approximately 17.5x EBITDA, I would place a little discount on Civeo as a result of its dependence on the cyclical resource industry as well as the more temporary nature (temporary in the 30 years sense) of its asset base. Even putting a 15x EBITDA multiple on Civeo, backing out the $775 million in anticipated debt (and not accounting for any cash on hand) I come up with a $5.6 billion valuation, which is slightly more than the entire market cap of pre-spin OIS. Even if you disagree with the comps, multiple, or discount the 2013 EBITDA for some anticipated slowdowns in Australia and corporate overhead, you're coming close to getting the remaining OIS for free. Post Spinoff, the Oil States stub will become a more focused energy services company with a TTM EBITDA of $435 million on $1.7 billion in revenue. I haven't spent as much time on the remaining pieces of Oil States, but assuming it remains valued at a little over 7x EBITDA (which looks reasonable given peers trade for 9-10x EBITDA) the stub is worth roughly $3 billion. Below is another list of comparables to give you an idea for where oil services companies are trading currently. $5.6 billion for Civeo and $3 billion for Oil States gives you a pre-spin value of $160 per share. I'm sure some of my numbers are a little optimistic, using EBITDA multiples obviously has its issues, and it will take some time for the REIT conversion to take place and for investors to fully value each component, but there's upside to be had here. Will traditional oil service company investors dump Civeo after the spin? Seems unlikely given that's what the investor base has been pushing for, but any blip due to selling pressure would be temporary. What about OIS, will that get dumped in favor of Civeo? This appears more likely than Civeo being sold indiscriminately, however it's already cheap and would be a bite sized acquisition target for larger players in the industry. Australia - Civeo is heavily exposed to the country's met coal market and thus the Chinese growth story which we've seen is slowing a bit and potentially in a massive housing bubble. REIT conversion doesn't occur, it appears that the IRS is softening up its stance on these non-traditional REITs (like Iron Mountain), but with Civeo structures not being 100% permanent, I could see it being viewed with a skeptical eye. Most value investors are aware of the spinoff strategy of buying the SpinCo after the initial wave of selling by unnatural holders or ones that don't want the orphan/bad business. But in this instance, I think that Civeo could be the more appealing company for new investors to come in post-spin due to the planned value unlocking strategy to convert to a REIT. So instead of waiting for the spin, I bought June expiration calls on OIS early last week, that way I have leveraged upside to the initial reaction to the spinoff which I expect to be positive, and the secondarily I plan to exercise the option, immediately sell OIS (unless it slumps) and hold CVEO until it converts to a REIT for that second leg up in valuation. Last Friday, News Corp announced the purchase of Canadian media company Torstar's book business Harlequin, best known as a romance novel focused publisher, for C$455 million (or roughly 8x 2013 EBITDA of C$56 million). I think its an interesting deal for both sides, more of an incremental move at News Corp and a transformational one at Torstar. News Corp was spun off of Twenty-First Century Fox last year (it was the spinoff but kept the name of the original parent) and unlike other recent spinoffs, the parent didn't saddle it with debt but instead let it go with $2.5 billion in excess cash. Originally News Corp created a share repurchase plan and discussed initiating a dividend, but it seems like plans have changed as neither have been utilized and instead News Corp has made a couple small digital purchases in Storyful and a UK Luxury Shopping site. Now comes a larger one in Harlequin, which is expected to be accretive to earnings and improve News Corp's free cash flow immediately. Harlequin has a strong brand and a loyal repeat customer base but has experienced trouble making the transition from print to digital under Torstar, maybe under News Corp this trend will improve? Romance novels initially seem like a great fit to be purchased and read digitally. Books like 50 Shades of Gray are incredibly popular, yet no one likes to be seen reading a copy on the train, it's easier and more stigma free to read it on your morning commute on a Kindle. Hopefully News Corp can implement some best practices learned from HarperCollins' move to digital at Harlequin, strip out some fixed costs, and cross sell HarperCollins books through Harlequin's much larger international distribution channel. It seems like News Corp paid full price, but as a strategic buyer there are some efficiencies to be gained anyway. I still think News Corp is an interesting spinoff as I outlined in this earlier post, they have a collection of book publishing and Australian assets that together with their cash position roughly equal the market cap of the entire company. The majority of their revenue actually comes from the remaining newspaper assets, which have strong valuable brands, but will take time to transition from print to digital. In the meantime, Murdoch has hinted at even more deals in the works, he's probably not done yet for the year. From Torstar's angle, it was interesting to listen to their investor call on Friday, analysts were congratulating the company on getting a full valuation for Harlequin, sending the stock price up over 20% on the news. The deal is more transformational for Torstar than it is for News Corp, Torstar will use the proceeds to pay down their debt and will be left with approximately C$260 million in net cash. Initially it sounds like Torstar will be investing the proceeds into the business or making an acquisition versus returning it to shareholders. Torstar's remaining businesses include the Toronto Star, 115 weekly community newspapers, and several joint venture holdings in other media assets. Maybe they could roll-up additional community newspapers in a similar fashion to New Media's strategy? It also sports a large dividend; on the surface it still looks pretty cheap.